Rediscovering the natural beauty of wood with sustainable, non-toxic, zero-VOC natural waxed finishes. 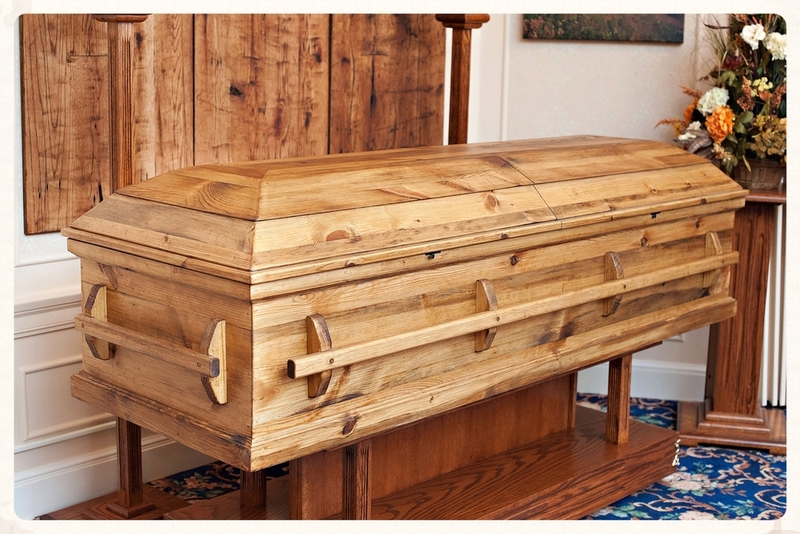 In the process of building a sustainable and eco-friendly casket company, we’ve had to learn a lot about eco-friendly wood finishes. The “Plain Pine Box” appeals to only so many. We’ve learned how to achieve a wide variety of beautiful wood finishes without using harmful chemicals. Most of our learning has been a matter of rediscovering the historic techniques mastered by 16th century English craftsman. In this article we’ll briefly cover the history, chemistry, and useful techniques for achieving natural waxed finishes. Wax finishes will bring out natural character in wood as well as help seal and protect the surface. Waxes have been used for centuries to seal and protect wood surfaces. Waxes are an effective sealer and provide a durable and protective coating. Conventional manufacturing has shifted to varnishes and polyurethane finishes that can be applied with spray techniques. Whereas wax finishes require some elbow grease and patience to get comfortable with the technique. In general, waxes must be first applied in a circular motion with an applicator pad, cloth, brush, or sponge. Within a minute or two wipe the wax in the same direction as the wood grain. And finally, buff the wax to a shine once the wax has begun to cure or dry. Buffing a wax finish takes some getting used to. You can buff waxed wood surfaces with a soft lint-free cotton cloth, a polyester auto-buffing cloth, or even an old polyester t-shirt or slacks. I prefer polyester because it is mildly abrasive and not absorbent. The trick is in the timing and pressure. Buff too soon and you will smear the wax around. Wait too long and the wax will be too hard to buff to a nice shine. Buff lightly with the same pressure you’d pet your cat or dog. Let the rag to the work. The more expert you get at applying the wax, the longer you will be comfortable waiting to buff—some experts wait hours to buff after application. Multiple coats can be applied to build up a thick protective finish. My favorite wax is clear carnauba wax. Carnauba wax is made by pressing the leaves of a palm tree. This wax is what is used to make M&M chocolate candy shells, lipstick, and automotive polish. It is available in bars, flakes, and paste. The bars and flakes are either pure or blended with beeswax. The paste form maintains the wax in suspension in a solvent—typically turpentine. 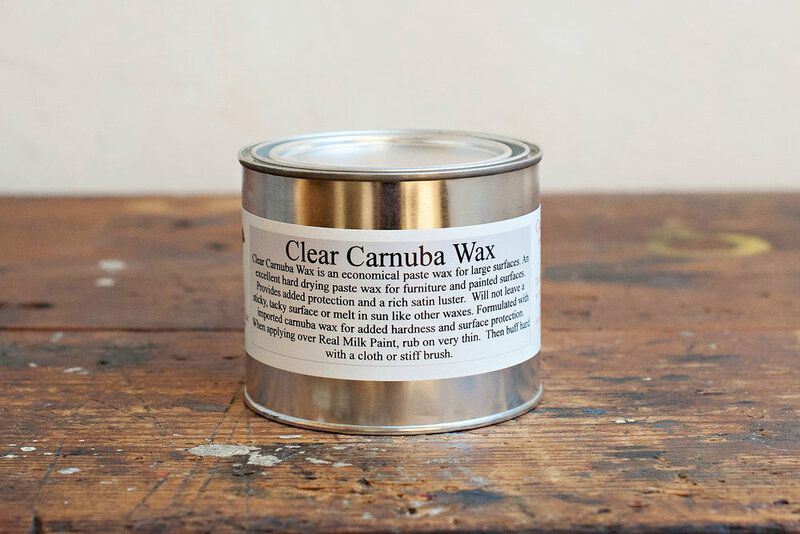 In paste form, carnauba wax is classified as either a Low VOC or VOC product. Once applied and the solvent has evaporated, the finished wood is 100% free of VOCs (important for making children’s toys or furniture). You can make your own wax paste with carnauba wax flakes and orange oil solvent or lemon juice. There is a newly patented wax product produced exclusively by The Real Milk Paint company. This wax is a proprietary blend of walnut oil, carnauba wax, and beeswax. They offer two colors: Warm Black and Chestnut Brown. These ingredients polymerize with exposure to the air to form a tight-sealing almost plastic-like surface. Water will bead up on this surface and it is 100% VOC free—perfect for table surfaces. Apply with a cotton cloth in ultra thin coats and let dry 24 hours. Then buff lightly with steel wool for a very smooth shiny surface. Apply multiple coats to your liking. All of these topcoat finishes can be layered for added protection, but not in any order. Finishes that require a porous surface must be applied first before others that seal the surface. For example, we often use milk paint + tung oil + wax. Wax can be layered on wax, but once the surface is waxed you could not apply more paint or oil as the surface will be sealed and there will no longer be a porous texture for milk paint or natural oil to penetrate and bond.